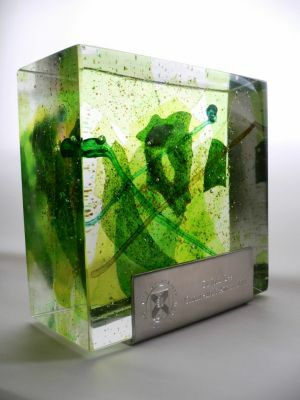 Hot cast glass award incorporated with blown shards and cast in 3 layers. Polished edges. Engraved stainless steel stand. (Image of bespoke Award for Edinburgh University's Chancellor's Award. Elin creates bespoke, handblown sculptural, lighting and architectural glass for individual and corporate clients by commission and she also sells sculptural glass in galleries in the UK. Previous clients are NHS and SAGA cruises.